This transitional side chair features both a slat back and contoured seat in a contrasting finish in order to create a perfect blend of classic style meets modern sensibility. The Lawton Transitional Slate Back Side Chair with Wood Seat at Morris Home in the Dayton, Cincinnati, Columbus, Ohio, Northern Kentucky area. Product availability may vary. Contact us for the most current availability on this product. 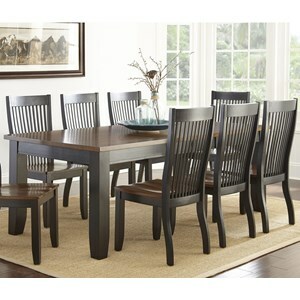 The classic design of this collection has been paired with updated, modern style in order to create a transitional look for your dining area. This blend of old meets new is especially perfect for adding a touch of everyday elegance to your home. Friends and family alike are sure to be impressed with the effortless style of this transitional collection. The Lawton collection is a great option if you are looking for Transitional furniture in the Dayton, Cincinnati, Columbus, Ohio, Northern Kentucky area. Browse other items in the Lawton collection from Morris Home in the Dayton, Cincinnati, Columbus, Ohio, Northern Kentucky area.